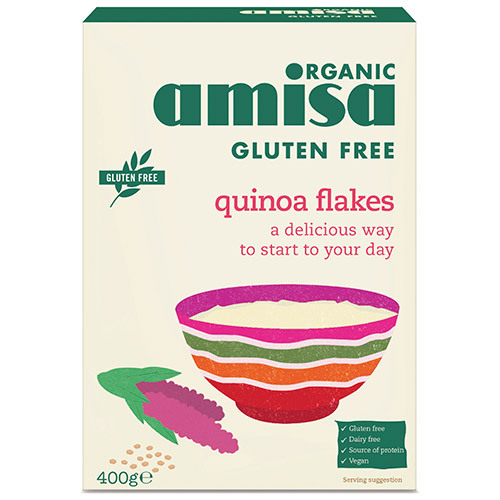 Start your day with Amisa Organic Quinoa Flakes for the perfect quick breakfast. They can also be used as an ingredient in baking or added to soup for some additional protein. Quinoa originated in the Andean region of Ecuador, Bolivia, Colombia and Peru, where it was successfully domesticated 3,000 to 4,000 years ago for human consumption. It provides a source of protein and fibre. Stir 1/3 cup quinoa flakes into one cup of boiling water or milk for each serving. Stir gently for about 30 seconds, until the flakes and liquid are thoroughly combined. Remove the saucepan from the heat and cover. Allow the mixture to stand for three to four minutes, or until the quinoa flakes have thickened to the desired consistency. The cereal will become thicker as it stands. Sweeten to taste. 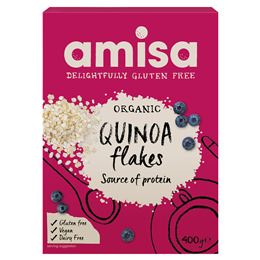 Below are reviews of Amisa Organic Quinoa Flakes - 400g by bodykind customers. If you have tried this product we'd love to hear what you think so please leave a review.